[Images: From ZATO: Secret Soviet Cities during the Cold War at Columbia's Harriman Institute; right three photographs by Richard Pare]. Speaking of Van Alen Books: earlier this week, they hosted a panel on the topic of "Secret Soviet Cities During the Cold War." These were closed cities or ZATO, "sites of highly secretive military and scientific research and production in the Soviet Empire. Nameless and not shown on maps, these remote urban environments followed a unique architectural program inspired by ideal cities and the ideology of the Party." [T]he cities themselves were never shown on official maps produced by the Soviet regime. Implicated in the Cold War posture of producing weapons for the Soviet military-industrial complex, these cities were some of the most deeply secret and omitted places in Soviet geography. Those who worked in these places had special passes to live and leave, and were themselves occluded from public view. Most of the scientists and engineers who worked in the ZATOs were not allowed to reveal their place or purpose of employment. [Image: Photo by I. Yakovlev/Itar-Tass, courtesy of Nature]. 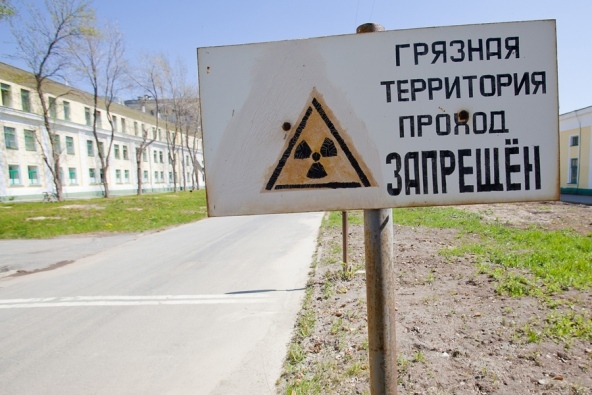 1) Just last week, Nature looked at Soviet-era experiments in these closed cities, where "nearly 250,000 animals were systematically irradiated" as part of a larger medical effort "to understand how radiation damages tissues and causes diseases such as cancer." In an article that is otherwise more medical than it is urban or architectural, we nonetheless read of a mission to the formerly closed city of Ozersk in order to rescue this medical evidence from the urban ruins: "After a long flight, a three-hour drive and a lengthy security clearance, a small group of ageing scientists led the delegation to an abandoned house with a gaping roof and broken windows. 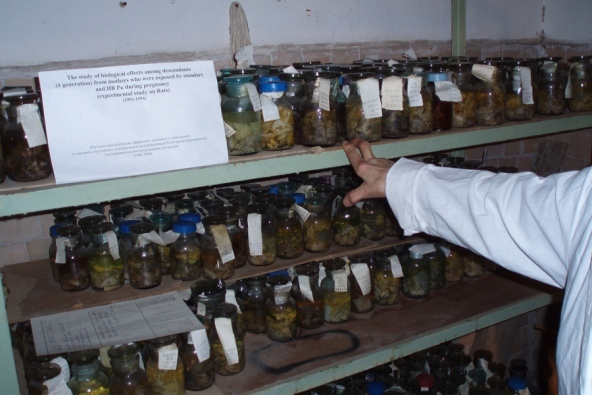 Glass slides and laboratory notebooks lay strewn on the floors of some offices. But other, heated rooms held wooden cases stacked with slides and wax blocks in plastic bags." These slides and wax blocks "provide a resource that could not be recreated today," Nature suggests, "for both funding and ethical reasons." Perhaps it goes without saying, but the idea of medical researchers helicoptering into the ruins of a formerly secret city in order to locate medical samples of fatally irradiated mutant animals is a pretty incredible premise for a future film. [Images: (top) photo by Tatjana Paunesku; (bottom) photo by S. Tapio. Courtesy of Nature]. 2) More relevant for this blog, you only have five days left to see the exhibition ZATO: Secret Soviet Cities during the Cold War up at Columbia University's Harriman Institute, featuring "ZATO archival materials, camouflage maps of strategic sites, secret diagrams of changing ZATO names/numbers, [and] ZATO passports." 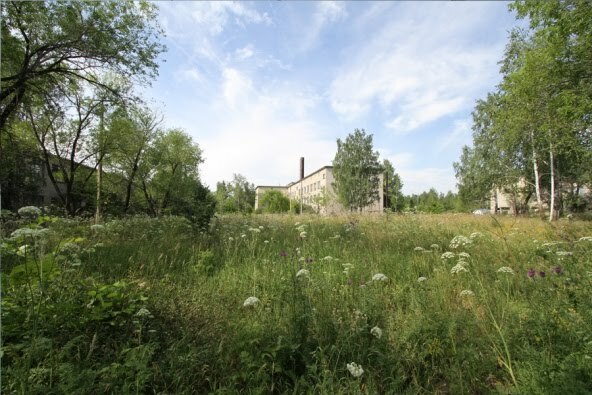 That exhibition documents everything from the "special food and consumer supplements given as rewards for the secrecy and 'otherness' of the sites," to the cities' eerily suburbanized, half-abandoned state today: "Today there are 43 ZATO on the territory of the Russian Federation. Their future is uncertain: some may survive; others may disappear as urban formations within the context of Russian suburbs." Check it out if you get a chance. More info at the Harriman Institute. The most striking quote to my mind is "some may survive; others may disappear as urban formations within the context of Russian suburbs". Unknown... have a look at "Lunopolis".